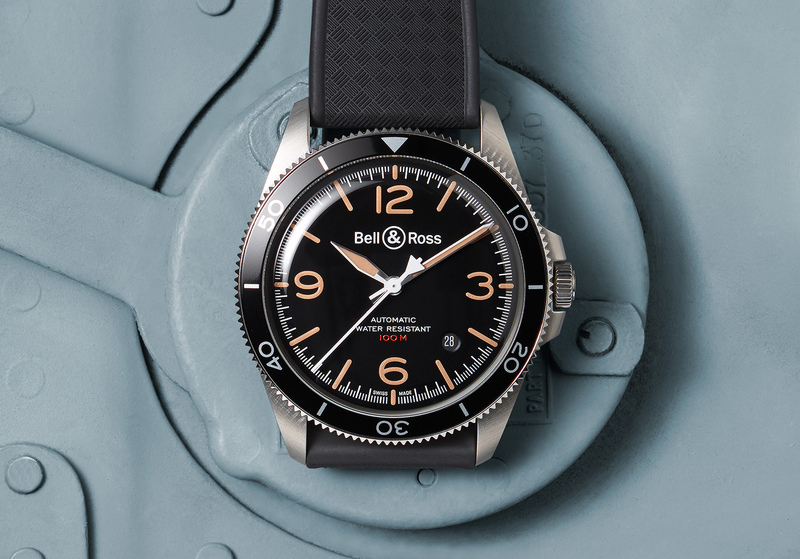 A year ago, Bell & Ross introduced the third generation of its Vintage family, a line that references elements from hugely coveted but unfortunately rare military-issue watches from the second half of the 20th century. The latest series retains the large Arabic numbers but with smaller and slimmer cases, while spawning several thematic variations such as the Bellytanker and Garde-Côtes. 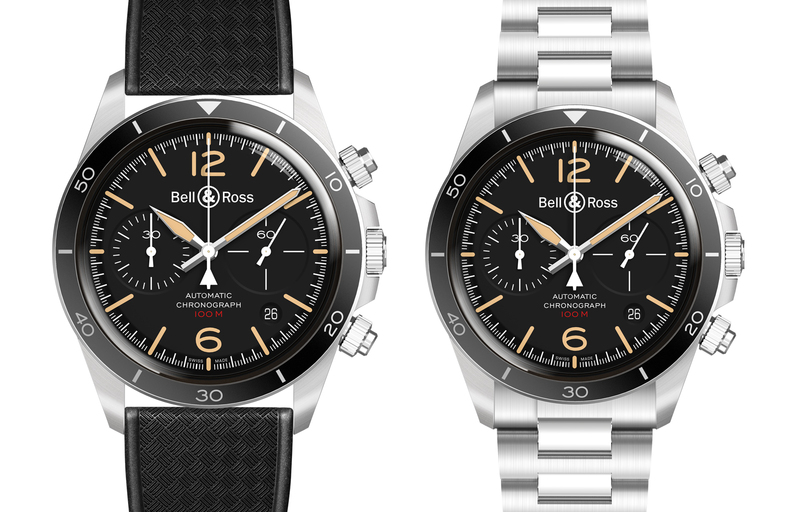 Now, way ahead of Baselworld 2018, Bell & Ross has unveiled the BR-V2 Steel Heritage – a two-piece range that continues to mine the vintage-inspired wave with a couple of nuanced tweaks. 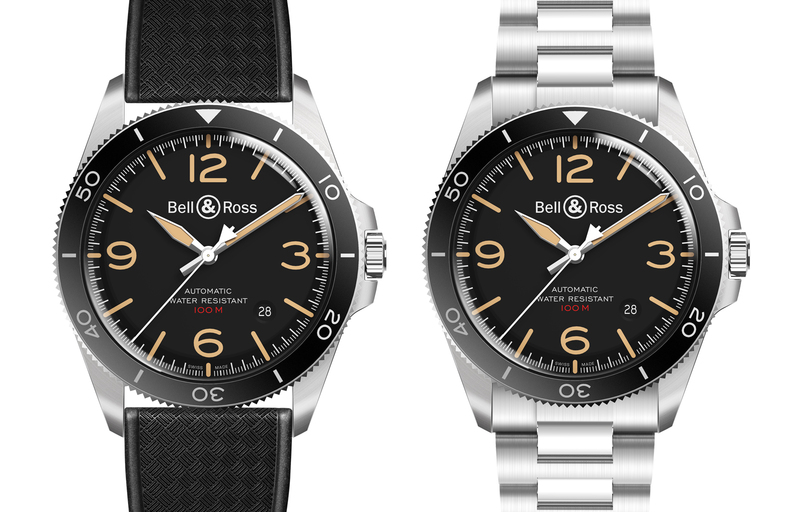 Both the BR V2-92 and the BR V2-94 Steel Heritage feature a colour palette that borrows heavily from vintage dive watches, although Bell & Ross’ heritage is strongest with military aviation watches. They have black dials with sand-coloured Super-Luminova that recalls the colour of aged tritium. The second retro element is the contrasting red depth rating on the dial – something most associated with the Rolex “Red” Submariner. And more unusually, the Steel Heritage is available with a rubber strap moulded with a crosshatch motif that recalls the “Tropic” rubber straps of the 1960s that were similar but perforated. Along with domed sapphire crystals, both Steel Heritage watches feature bi-directional rotating bezels, screw-down casebacks and crowns with protectors, blurring the lines between diving and aviation timepieces. The BR V2-92 Steel Heritage measures 41mm in diameter and is powered by the BR-CAL.302, which is a Sellita SW300 that’s visible through its sapphire caseback. 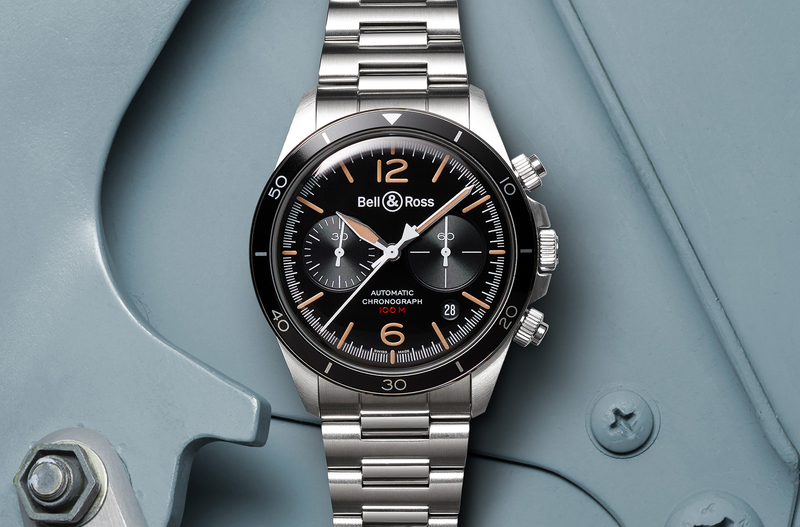 Also measuring 41mm, the BR V2-94 Steel Heritage is a bi-compax chronograph with screw-down pushers. 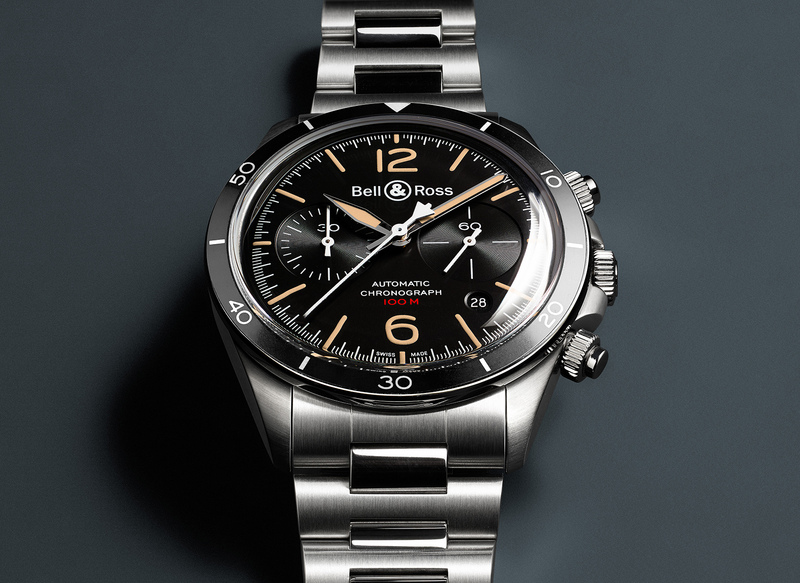 It is powered by the BR-CAL.301, which is an ETA 2892 with a Dubois-Depraz chronograph module on top. The BRV2-92 Steel Heritage costs US$2900 on rubber strap and US$3200 on bracelet. And the BRV2-94 Steel Heritage is US$4300 on rubber strap and US$4600 on bracelet. 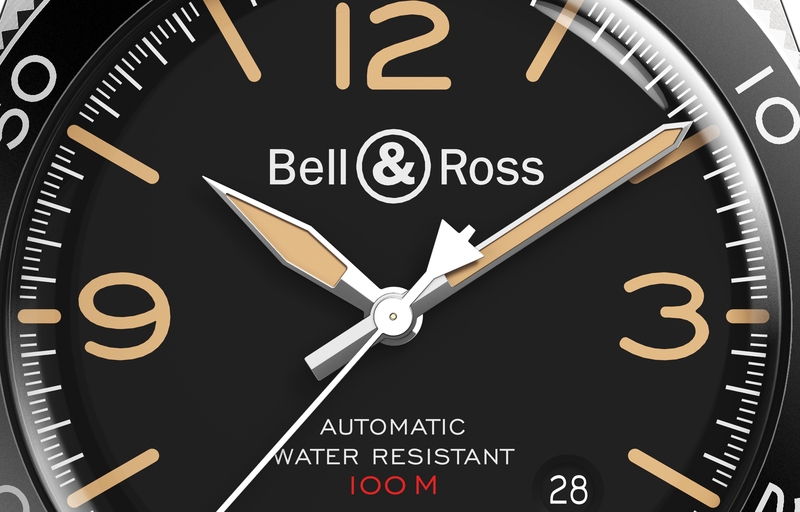 For more, visit Bell & Ross. Decorated with inked engravings, the BR 01 Burning Skull blends two recently fashionable motifs: a skull and tattoos. Monochromatic camouflage and a black ceramic case.